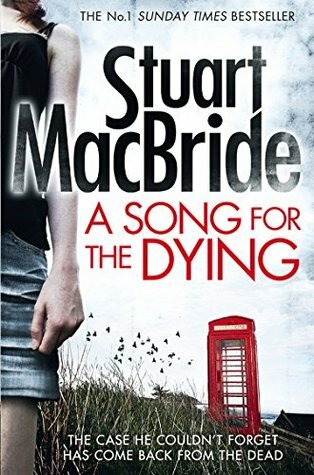 A Song for the Dying by Stuart MacBride is the second novel featuring Detective Inspector Ash Henderson. The book follows on from Birthdays for the Dead, and finds Henderson incarcerated after being framed for the murder of his brother. Henderson is now serving time, and all is not well. He receives regular beatings arranged from the outside by Mrs Kerrigan, the woman who framed him. Regular altercations, and violent outbursts, albeit in self defence, have scuppered any chance he had of parole. The future looks bleak for Henderson, and it very much looks like he'll be spending many more years behind bars being beaten at the whim of Mrs Kerrigan. After responding to a tip off, paramedics discover the body of a girl, a nurse, and rush her to hospital. The girl has sustained horrible injuries that investigators believe are the work of a serial killer known as the Inside Man, who's last victim was found 8 years previously. Henderson was closely involved in the original investigation of the Inside Man and the current lead detective approaches him with a view to him helping them hunt down the perpetrator of this latest attack. Henderson is released from prison but ordered to wear a tracking anklet, along with a sponsor whom he must remain within a hundred metres of, and joins the investigation team. I very much enjoyed Birthdays for the Dead, and this sequel doesn’t disappoint either. There is plenty of action, a very good plot, and some great dialogue between all of the characters. Dialogue is something I think MacBride writes particularly well and a lot of the story is told via the characters communicating. I’ve read most of MacBride’s Logan McRae novels, and while Ash Henderson is a very different character to McRae, there are some similarities to the storylines. There are quite a few violent scenes for instance, with plenty of blood and guts and some macabre elements. The characters come across as human - flawed, definitely not perfect. There’s also quite a lot of humour, most of it black, with more than a few light-hearted moments to enjoy. The story kept me interested, moved along at a brisk pace, didn’t dwell for too long on any one point, and definitely entertained me. I’m not sure whether Ash Henderson will return in a future novel, but I hope he does. Finally, I thought it would be worth mentioning that it’s not essential that you read Birthdays for the Dead before A Song for the Dying, but I’d definitely recommend it, otherwise you’re missing out on another excellent novel.